Just an evening on the car today so a small update. A few of the engine sensors are at the front and side of the engine so to tidy them up we are extending them to fit into a large wiring tube to securely fix it to the chassis rail that runs parallel to the engine frame. Just needs p clipping in place. There was no way we were going to get the wiring into the tunnel so we have routed it as one section entering the scuttle panel. We have now fixed the Rectifier and ECU in place; they won't be visible once the scuttle is in place. The components by the ECU, the fuses and relays will be attached next time to the support bar with a fabricated metal holder. No more time on that so back onto the kit car and to start with back electrics - AGAIN!!!! There is no information on how to do this in the MNR manual as there is such a huge variety of engines owners could fit. 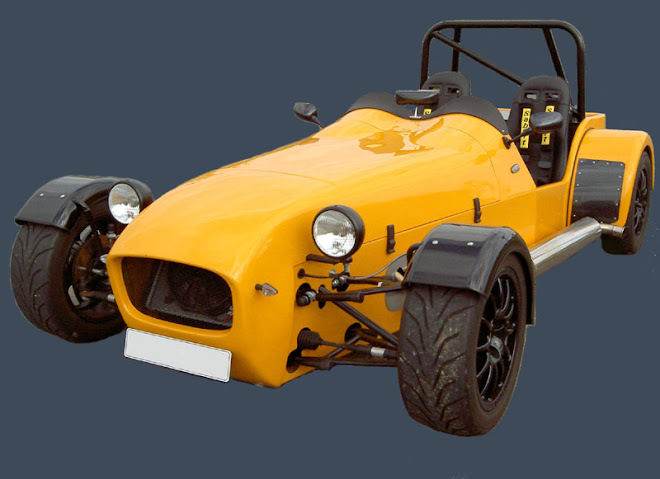 Members of Locost builders have been a great help and Rob Collingridge's site http://www.robcollingridge.com/kitcar has so much information on it I dread to think how long it's taken him, but sites like this make us glad we chose the quite popular R1. Once everything is connected like sensors, same coloured /size connectors, we can now modify the loom to be fit for the car. We removed anything to do with the lighting including relays, horn, AI systmen and fuel gauge wiring etc. We then went through the rest piece by piece. We started with the blue 2 pin side stands switch and soldered the black/blue and black together. The clutch switch which was connected to the white 10 pin connector needs the blue/yellow and black/yellow wires connected. The fuel pump wire was lengthened to our pump and then earthed. As this was left out we fed this into our tunnel loom in the protective covering - not easy as its p clipped in place and very tight! We recreated the EXUP servo motor by a making a small circuit to replicate it. An explanation of how-to and what to use can be found here http://www.locostbuilders.co.uk/viewthread.php?tid=70703. The lean angle cut-off sensor, the one with "UP" on it needs to be modified to be used in a car. We took it apart by disconnecting the wiring then releasing the clear plastic connector inside. Then the sensor can be pulled out. We superglued the pendulum in place away from the red dotted pick up points(or so we believe them to be) and then put some clear sealant around it in case it shakes free. For the fan we wanted to use the wiring from the bike to make sure the fan was used when the bike knew it was necessary so we cut the blue wire comming out of the fan relay and lengthened it to the front mounted fan and covered it in some protective wire covering. The main switch on ours (a red 4 pin connector) needs the blue/red and blue connected. The main switch (thick cables to 2 pin white connector) needs the red and brown/blue connected. The right handlebar, (ours blue 8 pin) needs red/black and red/white connected. Then the blue/white from the starter relay needs to be connected to the starter switch or ignition key with a black earth wire to create the starter circuit. We have also had to modify other parts of the wiring to route it properly and hide it round the frame to make it look slightly tidier. Still needs a tiny bit more work and some more fastners so I'll save a picture till next time. My Dad's been working on the tunnel cover as a solo project as its not something we can both work on at the same time. I'll leave it here for him to add a write up - whether he will or not is another question. OK Adam, here goes - I unwrapped the shiny black GRP tunnel cover moulding supplied by MNR and it was soon clear that it wasn't going to fit in place until it was exactly the right size. No easy marking and cutting job that I was hoping for then! First, height needed measuring to check we could operate the handbrake correctly (that looked OK). Second, the scoop in the moulding for the handbrake grip needs to be in the right place so I decided that any excess by length was coming off the front. Even when it looked the right length, there are four or five horizontal chassis tubes at the floor which prevent a trial fit until the moulding is cut to fit round them (both sides). I wouldn't really know if the angle of the cut at the back of the moulding was going to align with the back panel it butts aginst, until it was in place, but when I had finally trimmed it to the right size it looked pretty good. It even got a grunt of approval from Adam. Cutting a hole for the handbrake was a pain (hole saw, hacksaw blade and file) but eventually got it to the right size although I think it will need enlarging for a gaiter. We also fitted the handbrake to check for clearance with some M6 bolts and had to use quite a few washers at the front as the mounting left the bracket surfaces completly unalligned. 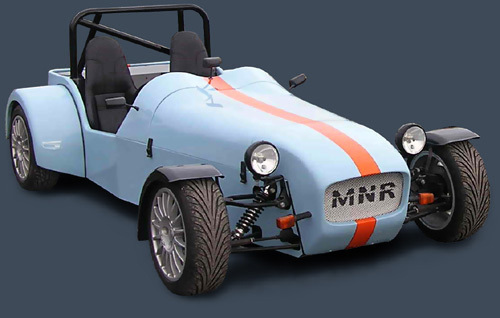 In the kit, MNR supplied two hoses (one for the top and one for the bottom of the radiator). Again no instructions and having seen others we're not completly sure on the set-up. Ours connects the bottom hose to the water pump with a T-off to the oil cooler. Top hose to the thermostat housing with a threaded nut for what we presume is for a temperature sensor. The small hose from the thermostat housing will go to the expansion tank along with the small hose by the waterpump which T-offs to the wax stat that also leads to the bottom of the cylinder head below the throttle bodies. Whilst my dad was doing the tunnel cover I fixed the radiator into place. The brackets were filed out to allow the radiator studs to locate and then the brackets at the top were filed to allow the radiator to be mounted with bolts. The hard plastic in the radiator was tapped out to accept a M6 x 1mm bolt and it all connected rather nicely once the hoses were trimmed. For the missing bits I'll be adding some more pics in the next few weeks.